In order to understand the sea, some of its chemical properties are important. This page details the chemical composition of sea water, salinity, density, its dissolved gases, carbon dioxide and pH as limiting factor. Chemical elements in sea water do not exist on their own but are attracted to preferential ions of opposite charge: sulphur will occur mainly as sulphate, sodium as sodium chloride, and so on. Dissolved gases: the two important gases to life, oxygen and carbondioxide. Limiting hydrogen ions and ocean pH. Bicarbonate: the life of dissolved carbon dioxide in the sea. global climate: learn about global climate step by step, from a very wide perspective. Is global warming real or fraudulent? (140p) Must-read! acid oceans: are oceans becoming more acidic? How does it work? Threat or fraud? (60p) Must-read! abundance of the elements of life in the universe, earth, sea and organisms. table of units & measures: units, measures, conversion constants, world dimensions, and much more. periodic table: the periodic table of elements, complete with elementary chemistry and interesting facts. the Dark Decay Assay: new discoveries of the plankton ecosystem. pH as most important limiting factor. The salinity of sea water (usually 3.5%) is made up by all the dissolved salts shown in the above table. Interestingly, their proportions are always the same, which can be understood if salinity differences are caused by either evaporating fresh water or adding fresh water from rivers. Freezing and thawing also matter. The main nutrients for plant growth are nitrogen (N as in nitrate NO3-, nitrite NO2-, ammonia NH4+), phosporus (P as phosphate PO43-) and potassium (K) followed by Sulfur (S), Magnesium (Mg) and Calcium (Ca). Iron (Fe) is an essential component of enzymes and is copiously available in soil, but not in sea water (0.0034ppm). This makes iron an essential nutrient for plankton growth. Plankton organisms (like diatoms) that make shells of silicon compounds furthermore need dissolved silicon salts (SiO2) which at 3ppm can be rather limiting. By adding the µmol in last column up, multiplied by respective valences, like: -546 +468 -56.2 +106.6 + .... one ends up with almost 0, suggesting that the above values are about right. During the Challenger Expedition of the 1870s, it was discovered that the ratios between elements is nearly constant although salinity (the amount of H2O) may vary. Note that the figures above differ slightly in differing publications. Also landlocked seas like the Black Sea and the Baltic Sea, have differing concentrations. 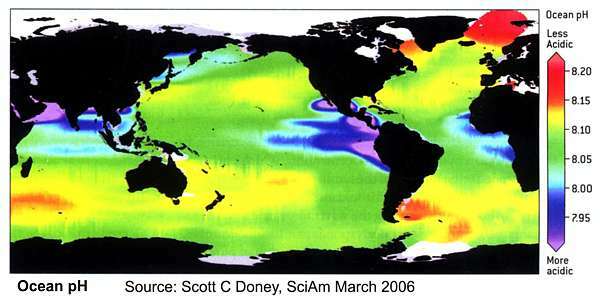 This world map shows how the salinity of the oceans changes slightly from around 32ppt (3.2%) to 40ppt (4.0%). Low salinity is found in cold seas, particularly during the summer season when ice melts. High salinity is found in the ocean 'deserts' in a band coinciding with the continental deserts. Due to cool dry air descending and warming up, these desert zones have very little rainfall, and high evaporation. The Red Sea located in the desert region but almost completely closed, shows the highest salinity of all (40ppt) but the Mediterranean Sea follows as a close second (38ppt). Lowest salinity is found in the upper reaches of the Baltic Sea (0.5%). The Dead Sea is 24% saline, containing mainly magnesium chloride MgCl2. Shallow coastal areas are 2.6-3.0% saline and estuaries 0-3%. Sea salt is made by evaporating sea water, but this is not straight-forward. Between 100% and 50% first the calcium carbonate (CaCO3= limestone) precipitates out, which is chalk and not desirable. Between 50% and 20%, gypsum precipitates out (CaSO4.2H2O), which also tastes like chalk. Between 20% and 1% sea salt precipitates (NaCl) but going further, the bitter potassium and magnesium chlorides and sulfates precipitate, which is to be avoided, unless for health reasons. In commercial salt production, the water is led through various evaporation ponds, to achieve the desired result. Note that this process has also happened where large lakes dried out, laying down the above salts in the above sequence. Note that normal sea water is undersaturated with respect to all its salts, except for calcium carbonate which may occur in saturated or near-saturated state in surface waters. An artificial salt solution of 3.5% (35ppt) is made by weighing 35g of salt in a beaker and topping it up with fresh water to 1000g. The density of fresh water is 1.00 (gram/ml or kg/litre) but added salts can increase this. The saltier the water, the higher its density. When water warms, it expands and becomes less dense. The colder the water, the denser it becomes. So it is possible that warm salty water remains on top of cold, less salty water. The density of 35ppt saline seawater at 15ºC is about 1.0255, or s (sigma)= 25.5. Another word for density is specific gravity. The relationship between temperature, salinity and density is shown by the blue isopycnal (of same density) curves in this diagram. In red, green and blue the waters of the major oceans of the planet is shown for depths below -200 metre. The Pacific has most of the lightest water with densities below 26.0, whereas the Atlantic has most of the densest water between 27.5 and 28.0. Antarctic bottom water is indeed densest for Pacific and Indian oceans but not for the Atlantic which has a lot of similarly dense water. The gases dissolved in sea water are in constant equilibrium with the atmosphere but their relative concentrations depend on each gas' solubility, which depends also on salinity and temperature. As salinity increases, the amount of gas dissolved decreases because more water molecules are immobilised by the salt ion. As water temperature increases, the increased mobility of gas molecules makes them escape from the water, thereby reducing the amount of gas dissolved. Inert gases like nitrogen and argon do not take part in the processes of life and are thus not affected by plant and animal life. But non-conservative gases like oxygen and carbondioxide are influenced by sea life. Plants reduce the concentration of carbondioxide in the presence of sunlight, whereas animals do the opposite in either light or darkness. In the above table, the conservative gases nitrogen and argon do not contribute to life processes, even though nitrogen gas can be converted by some bacteria into fertilising nitrogen compounds (NO3, NH4). Surprisingly the world under water is very much different from that above in the availability of the most important gases for life: oxygen and carbondioxide. Whereas in air about one in five molecules is oxygen, in sea water this is only about 4 in every thousand million water molecules. Whereas air contains about one carbondioxide molecule in 3000 air molecules, in sea water this ratio becomes 4 in every 100 million water molecules, which makes carbondioxide much more common (available) in sea water than oxygen. Note that even though their concentrations in solution differ due to differences in solubility (ability to dissolve), their partial pressures remain as in air, according to Henry's law, except where life changes this. Plants increase oxygen content while decreasing carbondioxide and animals do the reverse. Bacteria are even capable of using up all oxygen. All gases are less soluble as temperature increases, particularly nitrogen, oxygen and carbondioxide which become about 40-50% less soluble with an increase of 25ºC. When water is warmed, it becomes more saturated, eventually resulting in bubbles leaving the liquid. Fish like sunbathing or resting near the warm surface or in warm water outfalls because oxygen levels there are higher. The elevated temperature also enhances their metabolism, resulting in faster growth, and perhaps a sense of wellbeing. Likewise if the whole ocean were to warm up, the equilibrium with the atmosphere would change towards more carbondioxide (and oxygen) being released to the atmosphere, thereby exacerbating global warming. Since the volume of all oceans is 1.35E21 kg (see table of units & measures) and CO2 concentration is 9E-5 kg/kg (90ppm), it follows that the total amount of CO2 in all oceans is 12.2E16 kg = 121,000 Pg (Mt) and the partial carbon amount (12/42) = 34,700 Pg (600Pg in surface waters + 7000Pg in mid waters + 30,000Pg in deep ocean = 37,600Pg ). Compare this with the amount of carbon in soil and vegetation (1301 + 664 = 1965 Pg, see soil/ecology) and the carbon in the atmosphere, about 1 kg per square metre over 510E6 km2 = 510E12 kg = 510 Pg (700Pg ). It follows that the ocean is a very large reservoir of carbondioxide, also called Dissolved Inorganic Carbon (DIC). In addition to this, it contains Dissolved Organic Carbon (DOC) of unknown quantity. The difference between DIC and DOC is an arbitrary particle size of 0.45µm which passes DIC through filtration paper. This definition does not distinguish our newly discovered slush (incompletely decomposed biomolecules) as DOC. See our DDA section. What is dissolved, particulate, inorganic and organic carbon? Carbon is a miraculous element located in the middle of the Periodic Table, next to nitrogen, which is also a surprising element. Elements to the left are basic with positive valence (attracting free electrons) and those to the right are acidic with negative valence (owning loose electrons). Carbon with a valence of 4 can bind with both sides of the table and with itself. When combined with hydrogen, it forms long chains of organic molecules like CH3.CH2.CH2......X where the end group X gives it the character of an alkane (CH3), alcohol (OH), acid (COOH), aldehyde (COH), amino (NH2), and so on. The organic carbon chains can form loops and bonds with other elements, all being organic compounds. Only few inorganic carbon compounds are known, of which carbondioxide (CO2) is by far the most common. Natural gas or methane (CH4) is either the last inorganic molecule or the first organic molecule. So it is safe to say that dissolved inorganic carbon is CO2, particularly since it dissolves so readily in water. All biomolecules that make up the structure of an organism are organic (except for salts in body liquids), and when these are decomposed, the leftover molecules are also organic, except for inorganic nutrients and CO2, for the whole purpose of decomposition is to turn organic molecules into inorganic nutrients and CO2 for plants. All biomolecules can be transported by being dissolved in water. When an organism dies and decomposes, most of its organic molecules end up in solution as dissolved organic carbon (DOC), molecules that are very much smaller than the smallest of organisms (viruses). Plankton organisms are classified by size from femtoplankton (smaller than 0.2µm), picoplankton (0.2-2µm) to megaplankton (0.2-2m). Note that the wavelength of visible light is 0.4-0.7µm, which means that organisms smaller than 1µm are not visible under a light microscope (all viruses and most bacteria). What all this means is that measuring the biomass of plankton is almost impossible. For practical reasons, scientists decided that anything passing through fine filtration paper (0.45µm) is dissolved and all that is retained is particulate. Unfortunately this marks a substantial amount of particulate biomass as dissolved. Phytoplankton consists of organisms from bacteria to diatoms and large dinoflagellates (like sea spark, Noctiluca scintillans). Their biomass can be estimated by measuring their chlorophyl (green pigment) from light measurements. However, other pigments (brown, red) are also common and the amount of chlorophyl is only a small part of biomass. So, even quantifying the amount of phytoplankton is almost impossible. The bottom line is that the boundaries between dissolved, particulate, inorganic and organic are rather vague. Also the functional difference between producers (phytoplankton) and decomposers (most bacteria) is seldom acknowledged. In general the ratios between the various elements in seawater is constant, except where modified by life. In this diagram one can see how light penetrates no deeper than 150m for photosynthesis. Indeed at 800m, the ocean is pitch dark. In the surface mixed layer above the thermocline, water mixes sufficiently to sustain life. Gas exchange with the atmosphere is near-perfect such that the oxygen concentration in the water is in equilibrium with the atmosphere. But it rapidly decreases below 50-75m as photosynthesis declines while animals use up most oxygen. At around 800m oxygen levels reach a minimum (as also carbondioxide levels reach a maximum, not shown). Towards the deep and bottom water, oxygen levels increase slightly due to an influx of cold bottom water from the poles. Due to lack of oxygen, deep sea fish cannot be very active. The coloured curves for phosphate and nitrate show how these nutrients are almost completely used near the surface and how they gradually become available in the thermocline layer. Note how the Atlantic Ocean ends up with less nutrients than the Pacific and Indian oceans. The temperature curve shows the general idea of staying relatively high and constant in the mixed layer, then declining rapidly in the thermocline layer until reaching a near constant temperature of +3ºC in deep and bottom water. The maximum surface temperature of course depends on many factors, like latitude and season. Note that the concentration of CO2 in the atmosphere has increased from 280 ppm in 1850 to 360 ppm in 1998, and is still rising. It is estimated that about 50% of anthropogenic CO2 has been absorbed by the oceans. Because the upper atmosphere is bombarded by cosmic rays, some of the nitrogen atoms become radioactive isotopes C-14 with a half life of 5730 years. Once incorporated into organisms, its radioactivity decays slowly, allowing scientists to calculate the age of organic substances. Fossil fuels which have been underground for over 60 million years, have lost nearly all their radioactive carbon isotopes, and in this manner CO2 from burning fossil fuels can be distinguished from normal CO2 circulation. The diagrams below shows how fossil carbondioxide is absorbed by the oceans. As cosmic rays bombard the outer atmosphere, they are slowed down by the thin gases there. With their energy of billions of electron-Volt (eV) they produce fast neutrons that gradually slow down to that of thermal neutrons. At a height of about 9-15km, these neutrons collide with nitrogen-14 (normal nitrogen), producing radioactive carbon-14 (carbon with one extra neutron). The total amount of C-14 produced each year is about 9.8kg for the whole Earth, or about 1 atom C-14 for 1 trillion (1E-12) normal C-12 atoms. Nuclear tests have almost doubled the quantity in the atmosphere in a peak (year 1964) that is gradually becoming normal again as the peak is absorbed by organisms and the ocean. Radioactive carbon decays back to nitrogen by emitting an electron (beta radiation) at the initial rate of 14 disintegrations per minute per gram carbon. The C-13 carbon isotope which is not radioactive, occurs for about one in every 100 atoms C. The age of organic remains can thus be measured by counting beta radiation from disintegrating atoms, but a much more sensitive method is by counting all C14 atoms by mass spectrometry. Note that at a pH of 7.0 (neutral water) only 0.1 µmol/kg (10-7 ) of water is dissociated into positive hydrogen ions H+ and negative hydroxyl ions OH- . In the ocean where a pH of around 8 is found, this becomes even less at 0.01 µmol/kg, which makes hydrogen ions twenty times scarcer than oxygen and 200 times scarcer than carbondioxide. It explains how important the pH is to the productivity of aquatic ecosystems. Visit our latest plankton discoveries in the Dark Decay Assay section where this limiting factor was quantified in freshwater lakes. This world map of ocean acidity shows that ocean pH varies from about 7.90 to 8.20 but along the coast one may find much larger variations from 7.3 inside deep estuaries to 8.6 in productive coastal plankton blooms and 9.5 in tide pools. The map shows that pH is lowest in the most productive regions where upwellings occur. It is thought that the average acidity of the oceans decreased from 8.25 to 8.14 since the advent of fossil fuel (Jacobson M Z, 2005). in the ratios CO2 & carbonic acid H2CO3 = 1%, bicarbonate HCO3- = 93%, carbonate CO32- =6%. These variants of CO2 (species) add up to the total amount of Dissolved Inorganic Carbon (DIC), which also includes a smaller amount of Dissolved Organic Carbon (DOC) that passes filtration techniques. The <=> symbol means 'in equilibrium with'. These forms of carbon are always in close equilibrium with the atmosphere and with one another. When one talks about dissolved carbondioxide, it is the slightly acidic bicarbonate. When the concentration of CO2 in the atmosphere increases, presumably also the concentration in the ocean's surface increases, and this works itself through to the right in above equation. Photosynthesis of organic matter is often simplified as: CO2 + H2O + sunlight => CH2O +O2, which happens only in the sunlit depths to 150m and down to where the sea mixes. The average composition of marine plants is: H:O:C:N:P:S = 212:106:106:16:2:1 which comes close to CH2O. Respiration is often simplified as : CH2O => CO2 + H2O + energy, which can happen at all depths, depending on the amount of food sinking down from above. Therefore the concentrations of oxygen and carbondioxide vary with depth. The surface layers are rich in oxygen which reduces quickly with depth, to reach a minimum between 200-800m depth. The deep ocean is richer in oxygen because of cool and dense surface water descending from the poles into the deep ocean. It is thought that the carbondioxide in the sea exists in equilibrium with that of exposed rock containing limestone CaCO3. In other words, that the element calcium exists in equilibrium with CO3. But the concentration of Ca (411ppm) is 10.4 mmol/l and that of all CO2 species (90ppm) 2.05 mmol/l, of which CO3 is about 6%, thus 0.12 mmol/l. Thus the sea has a vast oversupply of calcium. 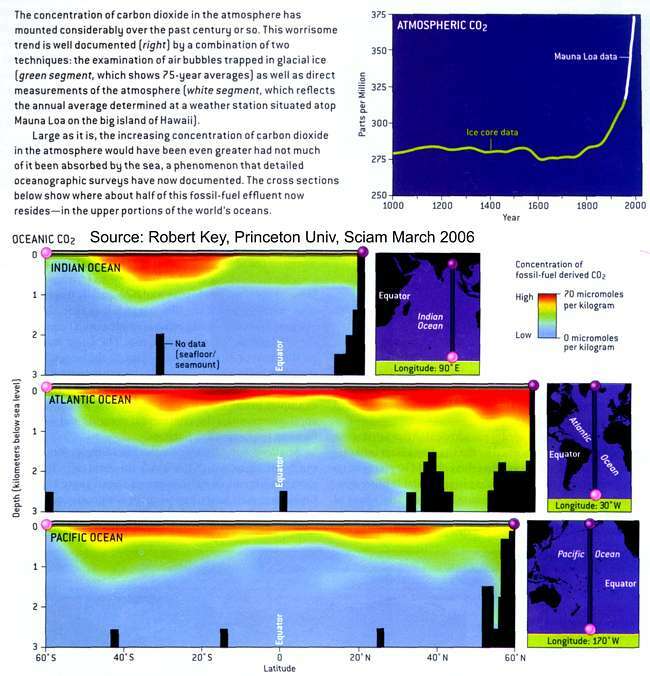 Report of the Royal Society (June 2005): Ocean acidification due to increasing atmospheric carbon dioxide.